If the cockpit lost pressure while the aircraft was above the Armstrong limit, even a positive pressure oxygen mask could not sustain pilot consciousness. The Armstrong limit or Armstrong's line is a measure of altitude above which atmospheric pressure is sufficiently low that water boils at the normal temperature of the human body. Exposure to pressure below this limit results in a rapid loss of consciousness, followed by a series of changes to cardiovascular and neurological functions, and eventually death, unless pressure is restored within 60-90 seconds. On Earth, the limit is around 18–19 km (11–12 mi; 59,000–62,000 ft) above sea level, above which atmospheric air pressure drops below 0.0618 atm (6.3 kPa, 47 mmHg, or about 1 psi). The term is named after United States Air Force General Harry George Armstrong, who was the first to recognize this phenomenon. At or above the Armstrong limit, exposed body fluids such as saliva, tears, urine, blood and the liquids wetting the alveoli within the lungs—but not vascular blood (blood within the circulatory system)—will boil away without a full-body pressure suit, and no amount of breathable oxygen delivered by any means will sustain life for more than a few minutes. The NASA technical report Rapid (Explosive) Decompression Emergencies in Pressure-Suited Subjects, which discusses the brief accidental exposure of a human to near vacuum, notes the likely result of exposure to pressure below that associated with the Armstrong limit: "The subject later reported that ... his last conscious memory was of the water on his tongue beginning to boil." At the nominal body temperature of 37 °C (98.6 °F), water has a vapour pressure of 6.3 kilopascals (47 mmHg); which is to say, at an ambient pressure of 6.3 kilopascals (47 mmHg), the boiling point of water is 37 °C (98.6 °F). A pressure of 6.3 kPa—the Armstrong limit—is about 1/16 of the standard sea-level atmospheric pressure of 101.3 kilopascals (760 mmHg). Modern formulas for calculating the standard pressure at a given altitude vary—as do the precise pressures one will actually measure at a given altitude on a given day—but a common formula shows that 6.3 kPa is typically found at an altitude of 19,000 m (62,000 ft). Blood pressure is a gauge pressure, which means it is measured relative to ambient pressure. To calculate blood pressure, it has to be summed to ambient pressure for calculating when blood will boil. This is similar to a flat automobile tire: even with zero gauge pressure, a flat tire at altitude of the Armstrong limit would still have an absolute pressure (pressure relative to a perfect vacuum) of 63 hectopascals (0.91 psi), that is, it will have the ambient pressure at the altitude where the 6.3 kPA pressure level occurs (about 18 km (60,000 ft)), both inside and out of it. If one inflates the tire to non-zero gauge pressure, this internal pressure is in addition to those 6.3 kilopascals (0.91 psi) of ambient pressure. This means that for an individual with a diastolic low blood pressure, typically 8.0 kPa (60 mmHg), the person's blood pressure would be 14.3 kPa (107 mmHg), the sum of the blood pressure and the ambient pressure. This pressure is more than twice the ambient pressure at the Armstrong limit. This extra pressure is more than sufficient to prevent blood from outright boiling at 18 km (60,000 ft) while the heart is still beating. Mario Pezzi a pilot in 1937 wearing a pressure suit to avoid hypoxia. Well below the Armstrong limit, humans typically require supplemental oxygen in order to avoid hypoxia. For most people, this is typically needed at altitudes above 4,500 m (15,000 ft). Commercial jetliners are required to maintain cabin pressurization at a cabin altitude of not greater than 2,400 m (8,000 ft). U.S. regulations on general aviation aircraft (non-airline, non-government flights) require that the minimum required flight crew, but not the passengers, be on supplemental oxygen if the plane spends more than half an hour at a cabin altitude above 3,800 m (12,500 ft). The minimum required flight crew must be on supplemental oxygen if the plane spends any time above a cabin altitude of 4,300 m (14,000 ft), and even the passengers must be provided with supplemental oxygen above a cabin altitude of 4,500 m (15,000 ft). Skydivers, who are at altitude only briefly before jumping, do not normally exceed 4,500 m (15,000 ft). 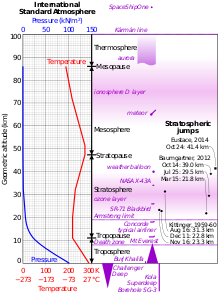 The Armstrong limit describes the altitude associated with an objective, precisely defined natural phenomenon: the vapor pressure of body-temperature water. In the late 1940s, it represented a new fundamental, hard limit to altitude that went beyond the somewhat subjective observations of human physiology and the time‑dependent effects of hypoxia experienced at lower altitudes. Pressure suits had long been worn at altitudes well below the Armstrong limit to avoid hypoxia. In 1936, Francis Swain of the Royal Air Force reached 15,230 m (49,970 ft) flying a Bristol Type 138 while wearing a pressure suit. Two years later Italian military officer Mario Pezzi set an altitude record of 17,083 m (56,047 ft), wearing a pressure suit in his Caproni Ca.161bis biplane even though he was well below the altitude at which body-temperature water boils. A pressure suit is normally required at around 15,000 m (49,000 ft) for a well conditioned and experienced pilot to safely operate an aircraft in unpressurized cabins. In an unpressurized cockpit, at altitudes greater than 11,900 m (39,000 ft) above sea level, the physiological reaction, even when breathing pure oxygen is hypoxia—inadequate oxygen level causing confusion and eventual loss of consciousness. Air contains 20.95% oxygen. At 11,900 m (39,000 ft), breathing pure oxygen through an unsealed face mask, one is breathing the same partial pressure of oxygen as one would experience with regular air at around 3,600 m (11,800 ft) above sea level. At higher altitudes, oxygen must be delivered through a sealed mask with increased pressure, to maintain a physiologically adequate partial pressure of oxygen. If the user does not wear a pressure suit or a counter-pressure garment that restricts the movement of their chest, the high pressure air can cause damage to the lungs. For modern military aircraft such as the United States’ F‑22 and F‑35, both of which have operational altitudes of 18,000 m (59,000 ft) or more, the pilot wears a "counter-pressure garment", which is a g‑suit with high-altitude capabilities. In the event the cockpit loses pressure, the oxygen system switches to a positive-pressure mode to deliver above-ambient-pressure oxygen to a specially sealing mask as well as to proportionally inflate the counter-pressure garment. The garment counters the outward expansion of the pilot’s chest to prevent pulmonary barotrauma until the pilot can descend to a safe altitude. ^ a b c d Geoffrey A. Landis. "Human Exposure to Vacuum". Geoffrey A. Landis. Archived from the original on 2009-07-21. Retrieved 2016-02-05. ^ John B. West (1 March 1999). "John B. West – Barometric pressures on Mt. Everest: new data and physiological significance (1998)". Jap.physiology.org. Retrieved 15 May 2012. ^ Cactus Web. "The Dead Sea Region as a Health Resort". Cfcenter.co.il. Retrieved 15 May 2012. ^ Basilevsky, Alexandr T.; Head, James W. (2003). "The surface of Venus". Rep. Prog. Phys. 66 (10): 1699–1734. Bibcode:2003RPPh...66.1699B. doi:10.1088/0034-4885/66/10/R04. ^ "Code of Federal Regulations". Title 14, Chapter I, Subchapter F, Part 91—General Operating and Flight Rules Subpart C—Equipment, Instrument, and Certificate Requirements, Docket No. 18334, 54 FR 34304 §91.211 Supplemental oxygen of August 18, 1989. Retrieved February 6, 2016.